Greetings from the first official summer holiday weekend! I’m writing this post while curled up in bed with a multiple masks on my skin – testing out Josh Rosebrook’s new Advanced Hydration Mask on dry patches and a mask I finally added to my collection: Tammy Fender’s Epi-Peel, on oilier/more congested areas. I know it’s been a while since I’ve provided an update on the products in my rotation and as many of you have told me through e-mail and on social media, I agree that individual product review posts do not really provide a comprehensive window into how exactly the products work or are being used together. So without further ado, these are the products I’ve been using regularly for the past month or have introduced recently. 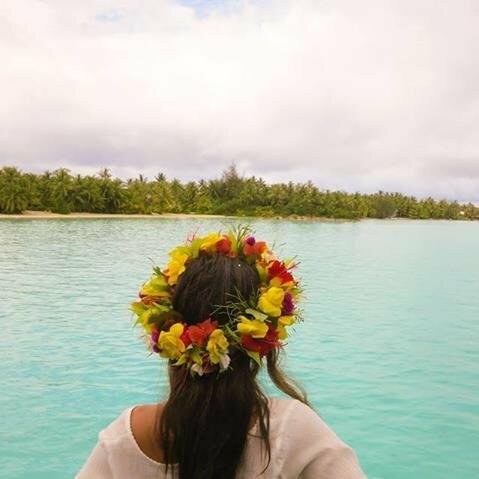 Sun: Spring and Summer is all about committing to sun protection. Mustela Broad Spectrum Mineral Sunscreen Lotion SPF 50+ has become one of my all time favorites and I have repurchased this about 5 times which is super rare as I love to try new products. For starters, this is a broad spectrum sunscreen that uses only mineral based sun protection (Titanium Dioxide and Zinc Oxide) rather than chemicals which can be unstable and irritating. I’m not speaking from an analytical standpoint on chemical sunscreens, I speak from experience as someone whose eyes burn with any combination of chemical sunscreens. I also prefer the way my skin looks and feels with a physical block, yes it leaves a white cast and feels heavier than a chemical screen, but if you put it on just right it works like a highlighter and your skin just looks more luminous while being protected. And yes Zinc Oxide physical blockers may feel weighty, but they’re also anti-inflammatory and can be mixed with foundation for tinted coverage. Comparatively, chemical screens always add an oily shine, require more frequent applications, and don’t hide any imperfections (in fact I’m pretty sure the shininess accentuates them). The SPF 50+ rating for Mustela is very rare for a non-chemical sunscreen so that is a huge bonus. There is a lot of evidence that many sunscreens on the market do not hold up to their sun protection claims, but Mustela is a brand that is developed from it’s French Lab origins which has higher compliance markers than the US (they have the seal of approval from the Melanoma International Foundation) and their line is specially made for the delicate skin of babies which makes this sunscreen even better for sensitive skin. They are categorized as a natural sunscreen but this isn’t really a botanical sunscreen and the ingredients are clean enough for me although some might not like that there are iffy ingredients like silicone. The kicker: a 3.4 oz tube costs only $16, which is INSANE for the quality you get, which may be why it’s sold out everywhere (Dermstore currently has 20% off but if they’re not allowing back ordering, try Sephora). Fragrance: My former Neiman Marcus co-worker says there are two types of women, those who invest in perfume and lip stick, and those who invest in skincare, I fall firmly into the latter group. I love sampling fragrances but cannot wear any because the synthetics are nauseating to me. I remember trying natural perfumes from Whole Foods and feeling like I was just throwing on essential oils from an aromatherapy class which felt too crunchy for my taste. Enter Kahina with their concentrated roll-on oil perfumes. Essaouira is a seaside Moroccan village, and their namesake fragrance is a fresh and crisp homage with notes of floral rose, sweet woodsy sandalwood, uplifting lavender, and a very pristine top-note of citrusy petitgrain. The perfume is 100% steam distilled essential oils which means it is powerful and concentrated yet never cloying as there are no artificial fragrances. The staying power is just right where you can catch it wafting with the summer breeze. And best of all, it actually smells like something I’d be able to get at a department store. Moisture: Weleda’s Soothing Almond Facial Lotion is basic, and that’s the point. This lotion is meant for sensitive skin and is hypoallergenic, and fragrance-free. With all the active serums, masks, toners in my rotation, I really wanted a moisturizer that just moisturized really well. This is that product. Sweet Almond Oil and Plum Kernal Oil both fight dryness, enhance softness and soothing properties that makes this lotion a pacifier for when you overdo it with the retinol or acid-toning. Too much action from acids and serums can lead to inflammation that ages skin and makes it more delicate, this lotion is my trick for avoiding that fate whenever I start seeing redness or feeling tightness and excess tingling and it has always come through for me. Acid Toner: Speaking of… I finally jumped on the Drunk Elephant bandwagon by taking the plunge on Drunk Elephant’s T.L.C. Framboos Glycolic Night Serum. I’m not a huge proponent of regular acid-toning, but during the summer with the sweat+excess oil production plus heavier sunscreen usage, pores are way more prone to clogging so I acid tone to basically let my skin breathe every few days especially if I feel a breakout developing. This is a transparent brownish gel that works best under a moisturizer and reminds me of Arcona’s The Solution. I just started using this night serum (which is really an acid toner), and like all glycolic acid based acid-toners, my skin tingled/burned a bit when first used but is now adjusting. That is one of the things I feel needs to be said: I know this brand made a splash by intimating that due to a lack of essential oils, their products will not cause irritation and be a sensitive skin’s best friend, which is a hefty promise that is unfortunately not realistic. All ingredients have the potential to cause irritation based on individual allergies and it is therefore not possible to have an ingredient much less a formulation that will work for everyone without triggering any sensitivities given that no two people are alike. Drunk Elephant may not use essential oils but they do use other active ingredients, in this case a 12% Glycolic Acid in addition to Tartaric and Lactic Acid which is very powerful and should be approached with some caution. I think there will be more people with sensitivities to this acid than a dilution of an essential oil like rose oil. It all depends on your personal skin sensitivity and how a product is formulated (concentration, other ingredients, other products used) that will determine how your skin gets on with the product so don’t blindly think this will work for you and don’t automatically assume anything with essential oils is going to be bad for you if you don’t have those sensitivities. This is not a critique on the T.L.C. Framboos Glycolic Night Serum, in fact I quite like the formula so far but I just wanted to provide clarity to what I felt was a problematic message by their founder regarding skin sensitivity. As for the actual product, I’ll be able to give more insight after I’ve used it a while longer. Mask: I’ve really been obsessed with masks lately. Beyond the two mentioned at the beginning, I finally got around to opening my Tata Harper Purifying Mask which is. oh. so. good. Truth be told, I like this more than her original Resurfacing Mask which is already one of my favorites. This is one of those cases where Tata’s tendency to stay in her own lane in terms of developing products that primarily suit her own skin type (mature – drier skin) is beneficial. This purifying mask is deep cleansing, removes “environmental toxins” and great for “eliminating surface build up” which is much needed in the summer, and because it’s a Tata Harper product – even the purifying mask is buttery and non-stripping. It spreads so easily and rinses clean, and is a total pleasure to use (the scent is very fresh and spa like, I’d describe it as crisp lemongrass meets zingy ginger)- only con is that it only comes in that one size which really doesn’t last long enough given how addictive this will be throughout summer. Seriously though, please – someone at Tata Harper, I’m glad you got the pricing under $60 but these masks HAVE to be offered in a size that is bigger than 1 oz. Serum: I think anyone who invests in skincare asks the question: “is this the best that money can buy?” With YÜLI, the answer is a resounding yes. Liquid Courage is their antioxidant serum which I use year round but especially for environmental protection and repair during summer. This serum is special, here’s why: mainstream lines throw in superstar ingredients next to an ingredients list of fillers that are cheap and don’t do too much, while green/organic lines just throw together a bunch of plant oils and call it an “antioxidant” serum or a super active serum. With YÜLI, each product feels like a realization of a dream product the same way that companies like BMW and Mercedes Benz design concept vehicles to realize purist visions outside of prohibitive production costs or other business considerations. Case in point: YÜLI designed Liquid Courage to be the antioxidant powerhouse with a base made of a botanical seed complex which is the densest natural source of nutrients and has the highest levels of antioxidant activity. Then there is the advanced form of Vitamin C that even a line like Sunday Riley has JUST incorporated as the star ingredient in her newly released Vitamin C serum, heralded as a cutting edge discovery. This just shows the level that YULI is on, as the same form of Vitamin C is just one of the many notable ingredients for this serum, when with any other brand’s product, much less Sunday Riley, it is treated as the singular superstar. YÜLI also put in Ferulic Acid and Vitamin E, which means, yup this is a cleanly formulated CE Ferulic serum with an organic antioxidant botanical seed oil base – basically all the best things for your skin in one bottle. Oh we’re not done: then there are peptides and their exclusive – biofermentation of black garlic which increases its antioxidant potency by 6 times. The serum sinks in effortlessly and has a crisp, bright scent of neroli, which like most of their ingredients, are grown right on their own farm which brings fresh to a new level as well. And while a “super oil” these days will often mean a blend of 11-20+ oils if that, at around the $200 mark, this one has 20+ of the most beneficial ingredients, including powerful ones that are not harnessed in this synergy anywhere else for $125. So yes, this is the best that money can buy and the fact that it comes in at the price it does shows they design the best products and really deliver on value, this is why YÜLI has earned such a cult following where their products are continuously sold out and it is also why I’m currently on bottle number 8 of this antioxidant serum. That’ll do it for this round-up, any products you have questions about? Drop a comment! I hesitate to even call this a product review, it’s more of a loving description of a constant companion during the past few weeks. 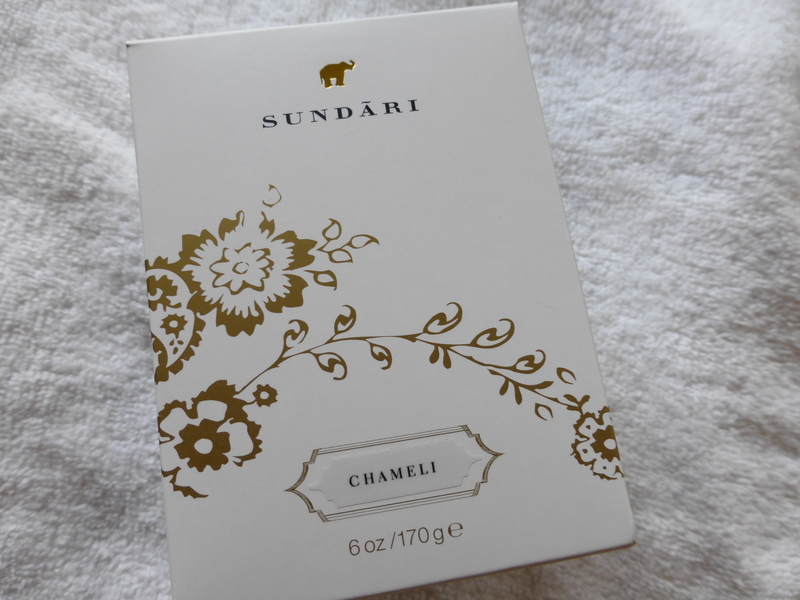 I first heard of Sundari’s line of candles when I searched for a line that made pure candles. To my surprise, there were few. Either the scents were synthetic or the waxes contained paraffin. 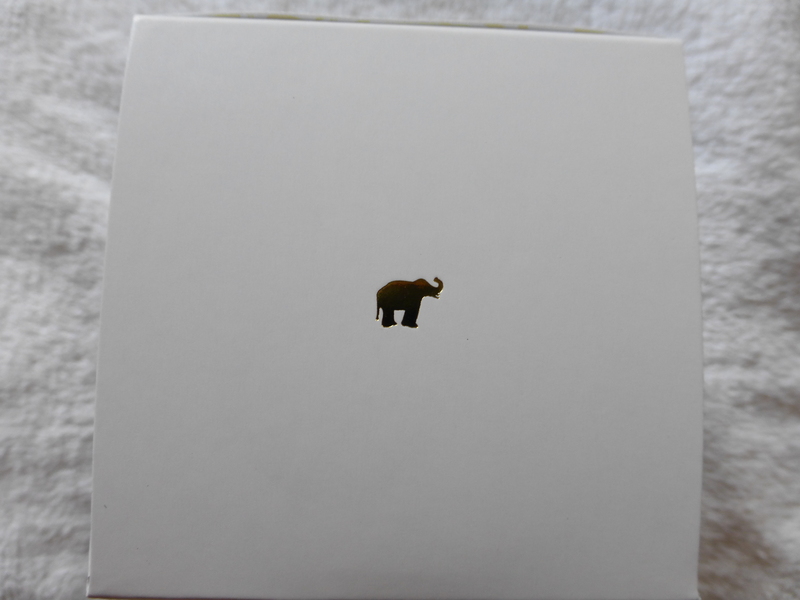 I was quite happy to learn that Sundari’s candles use a soy wax and are fragranced by the natural aromas of essential oils. While some of you might not care, I have personally found synthetic candles to be slightly nauseating to my body. I had to get rid of my beautiful Chantecaille and Byredo candles for this reason, though I’m still not parting with Diptyque just yet! 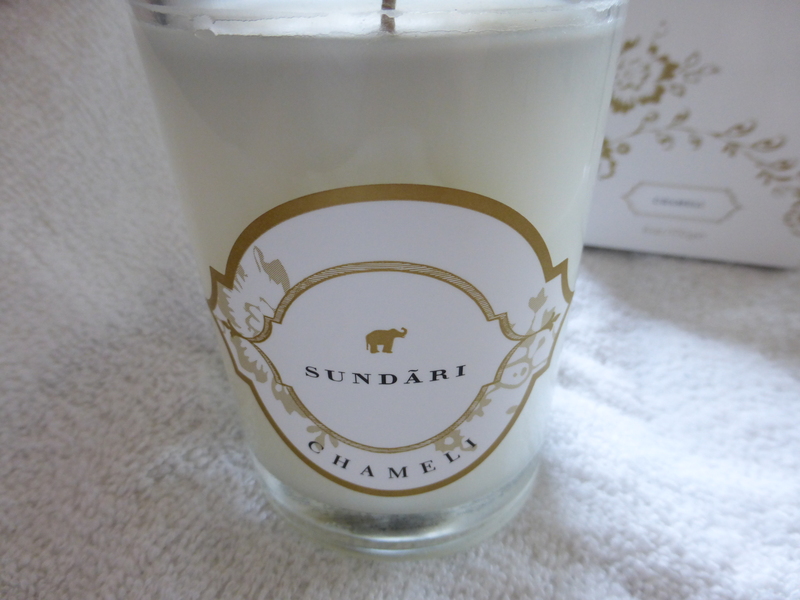 Sundari means ‘beautiful’ in sanskrit, which is an apt name for these luxurious candles. 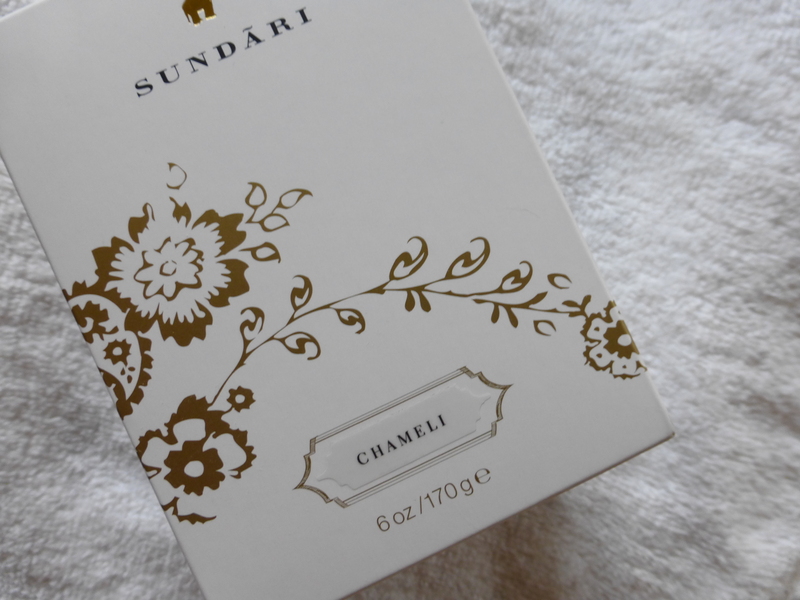 I chose Chameli (Jasmine) because as many of you can probably guess, I am a big fan of jasmine. Jasmine is the perfect fragrance and a natural jasmine scent will always, always eclipse a chemical substitute, which is why even Diptyque uses natural jasmine essential oils in their Jasmine candle. The aroma of the candle is complex, which is a luxury as you can really experience the multidimensional natural oils mingling with each other for a fragrance that is both rich yet crisp, heady but invigorating, spicy but subtle. This is a candle that possesses the quiet confidence in it’s sophisticated blend to not dominate your visual space like most candles, relying instead of its enticing aroma to lure you in. 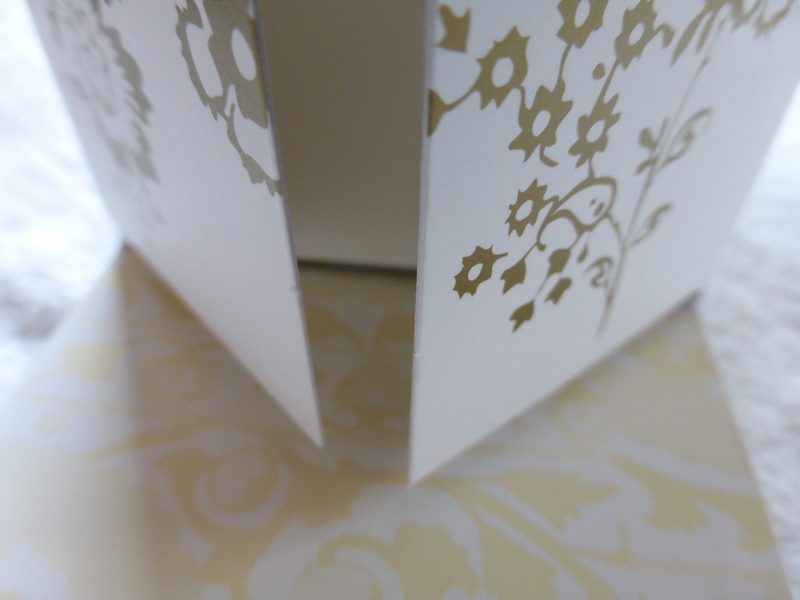 The fragrance notes consist of lotus flower, cinnamon, lemongrass, and an unmistakably divine jasmine. I found this incredibly calming and soothing, and an absolute pleasure when I needed to clear my head or take a few deep breaths to get my creativity flowing. 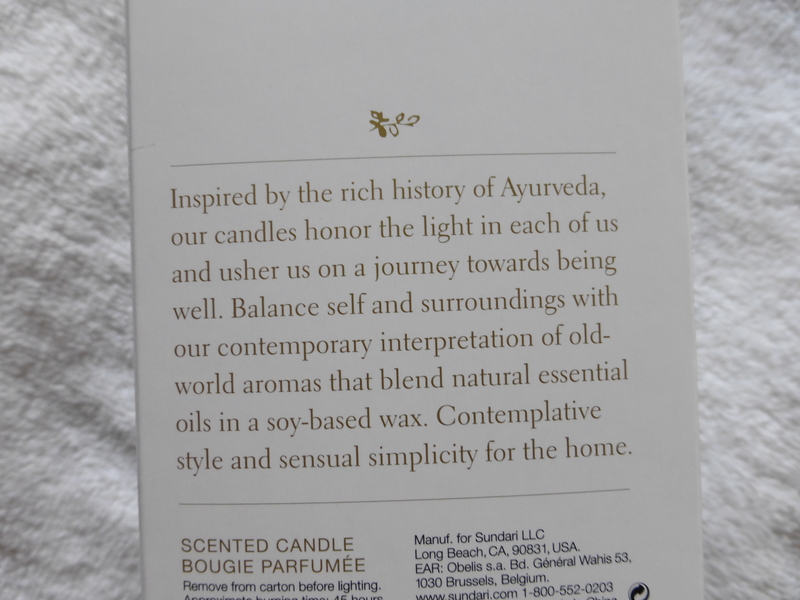 Another perk with Sundari’s candles is the focus toward spiritual and inner balance. This line stems from Ayurveda, a traditional Indian medicine system that focuses on the importance of healing and balance. Although I wouldn’t call this a medicine, the rich floral fragrance definitely provided an uplifting boost during finals that was at once invigorating and soothing. The burn is exceptionally clean and the fragrance lingers long after the gentle flame is extinguished. Compared to candles I’ve used in the past, the scent isn’t as strong when left unlit. A beautiful bronze lid is included to preserve the scent for this purpose. The approximate burn time is 45 hours and after its 45 hours are up, I plan on trying the other scents from this wonderful line. He is a very interesting man and I’ve enjoyed a couple of his scents, they are very thoughtfully created and have such a high attention to detail. He has very strong opinions on a lot of things which I applaud him for. I do think the analogy comparing natural fragrances to the architectural equivalent of a hut is inaccurate though. If we’re being technical, steel and glass are forged through naturally existing compounds, in the same way a natural perfume is forged through combining natural ingredients. The chemicals in this case wouldn’t be steel/glass, it would be the lead in the paint that goes inside the buildings. Whats interesting is in my Greek Civilization class in college, we learned that fragrances were all composed from naturally occurring scents until peoples clothing started becoming more opulent, which combined with infrequent bathing, led to a demand for stronger scents to mask body odors. This has translated into todays market believing that a well made scent has to have long lasting power and that the natural scent of our bodies was something unattractive. The result is that in order to create such strong products, we implement chemicals such as phthalates and synthetic fragrances which are known hormone disruptors, carcinogens, and skin irritants. I believe a study showed that women who worked in cosmetics: i.e. Sephora sales associates, were more likely to develop conditions such as thyroid cancer and infertility due to being immersed in the chemicals in their work environment. I’m not writing this to be scary. I actually do not think a natural perfume company has been able to compete with scents that I love from Serge Lutens and Jo Malone so I still buy them (although for anyone who believes you need synthetics and chemicals to create the foundation of a good fragrance, I urge you to check out Strange Invisibles or even Intelligent Nutrients Multi-functional Aromas), but I do believe that it is important to realize there is a reason people are becoming turned off from synthetic fragrances and that they’re valid reasons. I respect the work Francis Kurkdjian has done and his products are an amazing achievement in modern perfumary. I think we just differ a bit on our priorities regarding what makes good fragrance, but I’m sure many people will appreciate his candor and views and want to try his stuff.